The Vining Group consists of professional, full-time Realtors and support staff dedicated to delivering the highest level of service to our clients. As leaders in the Lake Oconee real estate market since 2003, The Vining Group rises above their competition with their knowledge, their experience and by actively adapting to our ever-changing real estate environment. Their happily returning and referring clients are a testament to their dedication and to the results they achieve. The Vining Group will help you sell your Lake Oconee home with stunning aerial photography and professionally edited videos. We are experts in marketing homes for sale, and our videos are an excellent example of that! Lake Oconee is the second largest lake in Georgia with 19,000 acres of water and 374 miles of beautiful, winding shoreline property. It is owned and operated by the GA Power Company and was formed as a source to generate hydroelectricity. It is a popular destination for full-time residents and second-home occupants alike due to the mild, seasonal climate and convenient location within the state. It is an hour and a half from Atlanta to the west and Augusta to the east. Macon is an hour south of the area, while Athens is a short 45 minute drive to the north. There is an ample supply of Lake Oconee property available in the various lakefront communities throughout the area. Many of Lake Oconee’s communities offer lake access via community boat ramps, and some offer day-use docking. Lake Oconee homes and lots for sale outside of the gated golf communities are more affordable than those located within the gates. You can get more house and acreage for your money when buying within a lakefront community, as opposed to a gated golf community. For individuals who want to own Lake Oconee real estate but don’t want the upkeep of a yard, dock, seawall, etc., there are several townhome and condo communities. These condos offer stunning lake views from the units, while providing maintenance and grounds keeping for the residents. Many part-time residents prefer purchasing lakefront condos or townhomes for the little to no maintenance required on these properties. Many Lake Oconee townhome / condo communities offer assigned boat slips or day-use docking, and some offer boat storage. 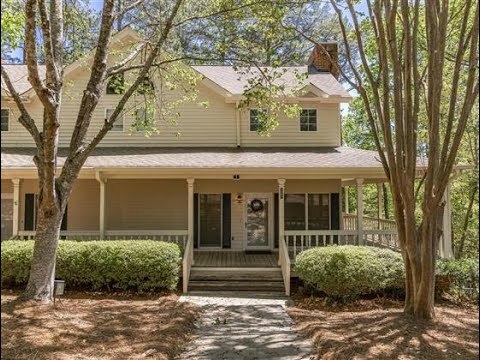 Another great Lake Oconee real estate option for people wanting to reside in the area with access to the lake, but no yard maintenance is Del Webb, an active adult community. Del Webb offers lake access with a boat ramp and docks, and also offers boat storage. They have a lakeside pavilion with outdoor fireplace and picnic tables, perfect for entertaining. There are several off-water communities in the area for people not wanting to live on the lake, or not needing easy access to it. Some are in a rural setting, while others are in quaint neighborhoods in historic Downtown Greensboro, Eatonton, and Madison. As you can see, there are several Lake Oconee options for interested individuals wanting to move to the area. Whether you are searching for a lake home, golf course home, townhome or acreage, there is a property waiting for you! With over 1,100 properties for sale, searching for the perfect one may seem overwhelming. Use our website to search for available properties and learn more about what the area has to offer. Once you find some properties that pique your interest, contact The Vining Group and let us schedule a viewing, show you around the area, and assist you in purchasing your Lake Oconee real estate! Jonathan and Alyce Vining have been nothing but the best Realtors we could have asked for during our extended process to find the perfect lake home. Their patience and diligence to find exactly what our family wanted and needed is so greatly appreciated. We have found a home that is perfect for our family to grow into. They were always willing to make time during their busy schedule to accommodate for our multiple visits to Lake Oconee to see as many homes as we wanted. Post-closing date, they continue to help with all the final questions our family has for our moving process to a new area. Alyce was our primary contact during the entire process, and she completely understood what exactly we were looking for, and would not stop looking until we found it. She stuck through about two years of looking, and for this we are so grateful. She knew the importance of fitting the present and future state of our family into our new home. We would 100% recommend The Vining Group to help assist you in looking for the best home on Lake Oconee.